Muscle Building and support for horses. Our horse Muscle Builder is designed to provide the optimum levels of the key amino acids responsible for muscle development, strength, power, stamina and to aid recovery from exercise. The ingredients in muscle builder are both clinically and scientifically proven to aid muscle developement and recovery and our muscle builder contains a staggering 5 times more amino acids in total per feed than other brands, but importantly it contains the KEY amino acids that the latest scientific papers suggest are responsible for muscle development and recovery. 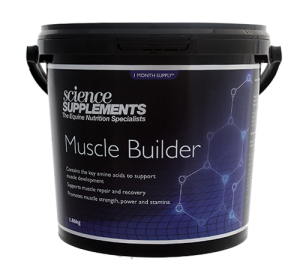 If you are looking for superior support and a horse muscle builder that delivers, then look no further.